Maurizio Nari and Ronnie Milani met in 1996. Staring off their career playing at Italys top clubs such as Hollywood in Milan, Prince in Riccione, and Vogue in Rome, they began creating productions such as Gnor,Gnuk, and Sunshine & Happiness featuring Darryl Pandy under aliases including Nerios Dubwork and Unconditional, achieving the Billboard Charts hotspot and finally... launching the Nari & Milani project back in 2003. 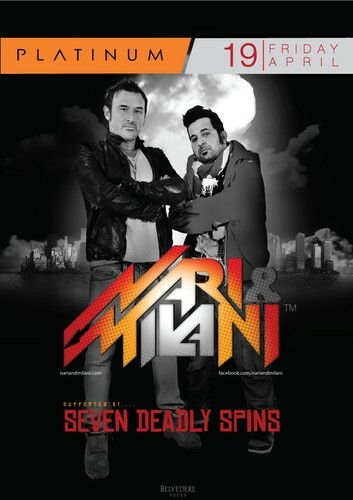 After conquering Italy, Nari and Milani went international and began touring di- splaying their trademark DJ sets in some of the worlds best clubs such as We Are Family in Moscow, Quantum in Dubai, and Club Maktum in Korea. Over the last decade the duo have remixed dance tracks for luminaries such as Rogez Sanches, Laidback Luke, and Axwell in addition to unleashing their own original productions through some of the best record labels in the industry including Bob Sinclars Yellow Prod, Robbie Riveras Juicy Music and Steve Angellos Size Records. Nari & Milanis Kendo is one of the biggest club bombs ever and gained early support from Swedish House Mafia, Pete Tong, David Guetta, Steve Aoki, Chuckie, Hardwell, Tiesto, Sandern Van Doorn, Alesso, Bob Sinclar, Fatboy Slim, Eddie Halliwell, Laidback Luke, and numerous others. But the boys didnt stop there, in March 2012 Nari and Milani followed up their debut track on Size Records with sophomore track Atom, almost instantly gaining support from Tiesto, Steve Angello, Thomas Gold, Sebastian Ingrosso, Axwell, which really displays how versatile these hit-makers are. Supported by Seven Deadly Spins.